About a dozen complaints have now been received from Aspasians vendors who were either unable to set up their booth or who had to take it down early because of Hurricane Ike’s strong winds and heavy rains this past Saturday. Considering the old rule of thumb in the radio business that one complaint represents about 10 unhappy people, it appears that the Aspasians need to do something fairly soon to keep their vendors for the next Fair in the Spring. All of the complaints can be read in the “Comments” sections of the “Aspasians Fair” and “Complaints” posts. Do you think the Aspasians should return the $114 entry fee, or at least apply it to the next event in the Spring? What can unhappy vendors do about losing their money? We’ll contact the Aspasians tomorrow and provide you with their response. It should prove interesting! 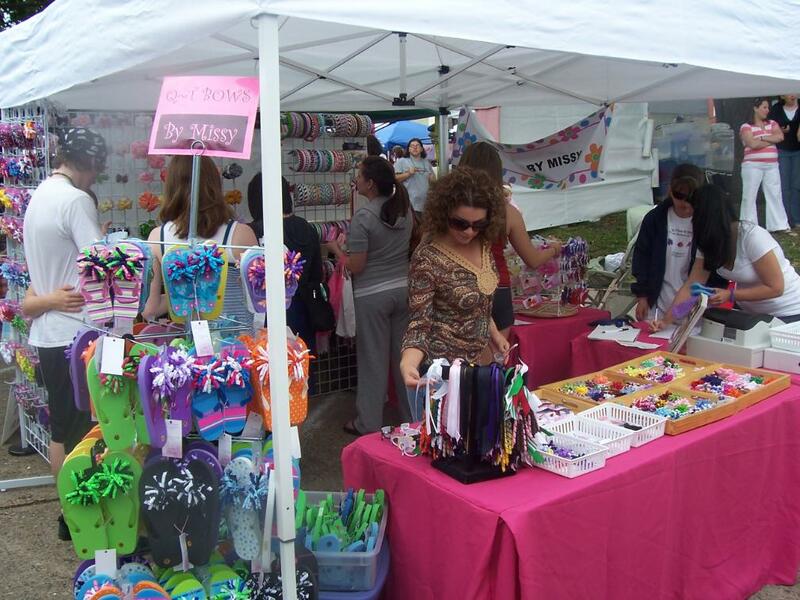 We’ve received several complaints from people who have paid their $114 entry fees to tomorrow’s Aspasians Arts & Crafts Fair who feel the event should be postponed and entry fees refunded due to expected strong winds and heavy rains from Hurricane Ike. One person angrily suggested that the Aspasians already have obtained their money so they could care less what happens! The Aspasians’ telephone voice mail message tonight is: “Tomorrow’s show will go ahead as planned…” The message suggests that weights can be purchased at sporting goods stores to keep tents from blowing away. Exhibitors are told they will not be penalized for the Spring 2009 show if they don’t come tomorrow. What do you think? Should the Aspasians refund fees to anyone who decides not to set up tomorrow? I just learned that the popular, semi-annual Aspasians Arts & Crafts Fair will be held again this Saturday, Sept. 13 on the Downtown Square in Old Town Rockwall. Proceeds are used to fund college scholarships for Rockwall teens. Thousands of Rockwall-ites typically come and enjoy purchasing a variety of arts, crafts and foods. People watching is fun, too. Unfortunately it also frequently rains. This weekend there are weather advisories, due to Hurricane Ike, of strong winds and heavy rains. Looks like it’s Aspasians time again! Hurricane Ike is expected to hit the Texas Gulf Coast this weekend – likely Houston – as a full-blast Category 3, or maybe even 4 storm. Because this hurricane is so unusually wide – stretching over 200 miles out from the eye – alerts are now being sent to the DFW area to be especially careful this weekend because strong winds up to 60 mph and rain up to 4-6″ are expected locally. At least one event has been postponed. Ironically, the Emergency Preparedness Expo cannot be held at The Church of Jesus Christ of Latter-day Saints in Heath because the emergency personnel who were going to attend must be on duty in case of emergencies in Rockwall County. The event will be rescheduled. The Aspasians Arts & Crafts Fair is still scheduled but… Oh well, it almost always rains on this event! But it’s still lots of fun! One other major event is the Law Enforcement Appreciation Dinner at the Hilton Hotel. Since over 400 people have purchased tickets, the event will likely be held, regardless of the weather. The Rockwall Aspasians group, which sponsors the popular arts & crafts fairs on the Rockwall downtown square each Spring and Fall to fund college scholarships, donated $40,000 in scholarships recently to graduating high school seniors from Rockwall County. According to Chairman Terri White, four $10,000 scholarships were awarded by the 35-woman group to two students each from Rockwall High School and Rockwall-Heath High School. The memorial scholarships were named to honor the memory of the deceased sons of two Aspasian members. During the past 30+ years, the Aspasians organization has donated over $600,000 in college scholarships to nearly 100 students from Rockwall high schools, White said. The day-long Aspasians Arts & Crafts Fair was a big success March 29 – largely because it didn’t rain, as it usually does. The twice-per-year event, held on Rockwall’s Downtown Square, all around the old County Courthouse, is always lots of fun and attended by thousands of people. It’s a great place to meet friends you haven’t seen for a while. But it usually rains in either the morning or afternoon, which tends to slow things up a bit. Not this year! The weather was beautiful, so thousands of lovers of arts, crafts, clothes, purses, sunglasses, jams, jellies, salsas, roasted corn, roast turkey on a stick, cotton candy, popcorn and so much more were there in attendance all day long. Although my wife and I didn’t buy anything this time, cash registers did seem to be ringing…or beeping…or whatever they do nowadays. Everyone looked happy. Proceeds raised by the Aspasian ladies from booth sales go towards college scholarships for Rockwall ISD High School students. Great ladies, great fun and can’t wait ’til Sept. or Oct. for the next one. But don’t ask what the word “Aspasians” means…because nobody seems to know – not even the ladies! It’s apparently a word that someone made up…and it stuck! Good job, somebody!